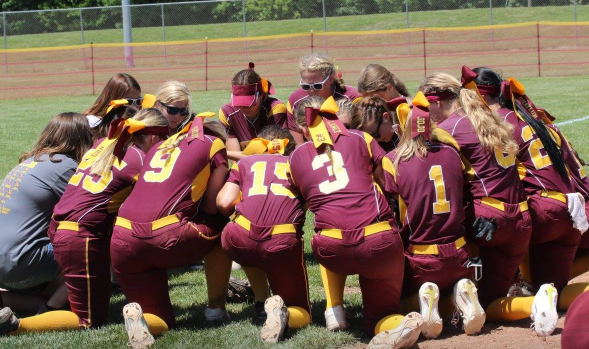 The Craw-Kan "Your Community Technology Partner" Team of the Week from the Southeast Kansas area is the Girard Lady Trojans softball team. Girard, led by head coach Jim Vinze, captured their first ever state softball title on Friday in Emporia. Prior to March, Girard had never had a state team title in the history of its school, boys or girls, now the Trojans have two, one in 4A-II basketball in March and one softball captured last week. GHS won the state title by going 3-0 at the state tournament by outscoring opponents 34-to-11 with victories over Clay Center (15-to-8) in the quarterfinals, Pratt (13-to-2) in the semifinals and Haven (6-to-1) in the finals. The Trojans have been led by their outstanding pitching of Shaylun Grosstephan and Shelby Smith all season long. In the title game, junior Sydnee Crain went 2-for-4 with two RBI, while junior Jacey Murphy picked up two hits, an RBI, and scored a run. The Trojans only lose one senior, Calea Augustin, which was a huge part of their lineup this season, including hitting a grand slam in the semis against Pratt. Augustin was also an all-state selection in basketball this past March. Girard finished the year 19-4. The CNC league also added a 3A state title from Riverton this week. Craw-Kan “Your Technology Partner" and Sports in Kansas will once again be in partnership over the 2016-2017 school year to release a "Craw-Kan Team of the Week".